Our theme this year is Building the Future, and that is truly what we do every day at Wallace. We build students who are confident, creative, peace-makers, and contributors. We create LEADERS! Just as construction can be a challenging job where you leave work sore and a bit dirty – so is teaching. But the results we produce are far more valuable than any architectural project because we are raising the future of our country. We are so glad you will be joining us in the trenches this year as we work together to build our masterpieces ... our students! Have you created your account on this website yet? It's free and easy! Registering only takes a few minutes, and allows you to purchase spirit wear and school supply packages, join the PTA, sign up for volunteer opportunities, and much more! Register for your free account now. Did you know your purchases can make a difference? 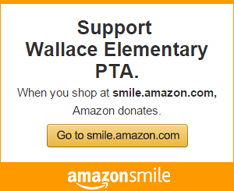 AmazonSmile will donate 0.5% of the price of your eligible AmazonSmile purchases to Wallace Elementary when you do your shopping using this link. Same great products, same prices, same service. This year, each class has a set of iPads for all students to use. We only use the iPads when they enhance learning because we consider them to be learning tools. We look forward to having students collaborate, create, and express their thinking via technology. Find out more about student use of iPads.